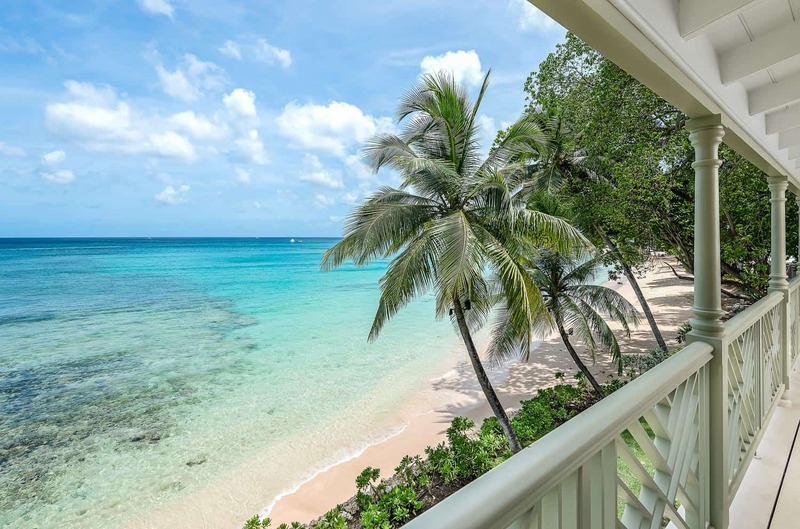 Welcome to Casa Hemingway, a new beautiful luxury beachfront home in Barbados! 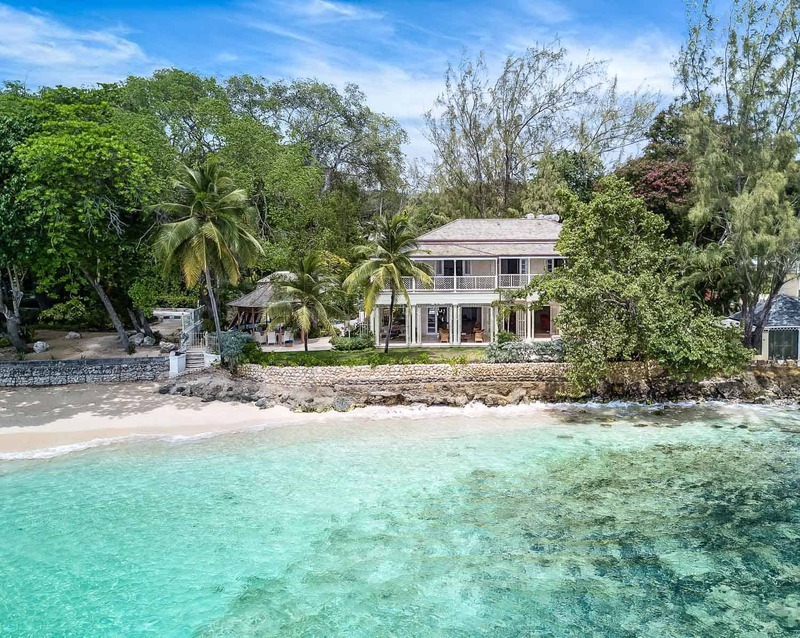 Top architect Larry Warren’s latest plantation style designed Hemingway House is tucked away between the serenity of Gibbes Beach and the highly popular Mullins Beach. 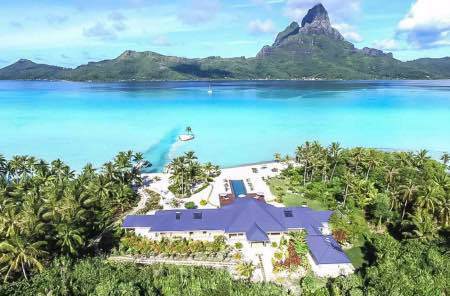 This unique home offers a gorgeous and unique vantage point with Mullins Bay to the North, and the glistening, vast ocean directly in front. 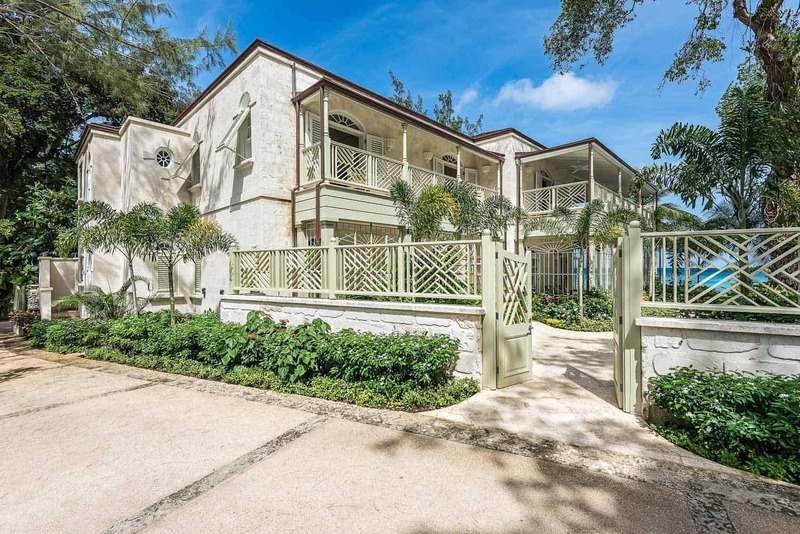 The two-storey retreat is finished in coral stone on both its exterior and interior with handcrafted sconces, recessed lighting, ceiling fans and air condition throughout. 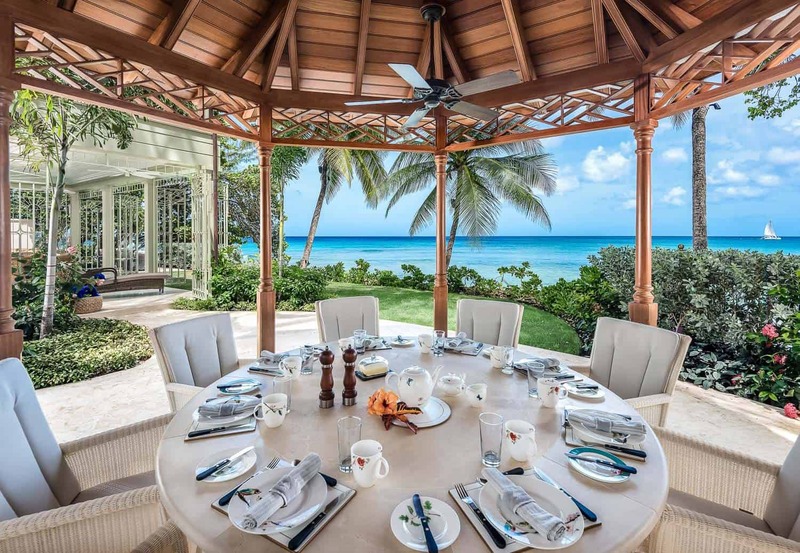 An oceanfront gazebo with a marble dining table is set within the lush tropical gardens, perfect spot to enjoy outdoor dining. 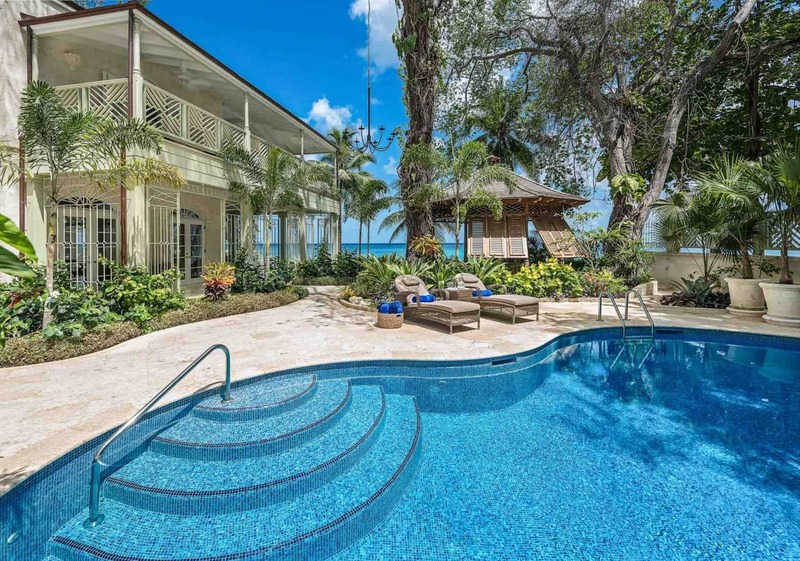 The lagoon pool borders the gazebo and is partially enclosed by a beautiful rock backdrop from which Bougainvilleas cascade. The garden’s statement piece is a lovely outdoor candelabra that was a gift from the architect and it hangs beautifully from a shady tree completing this tranquil setting. 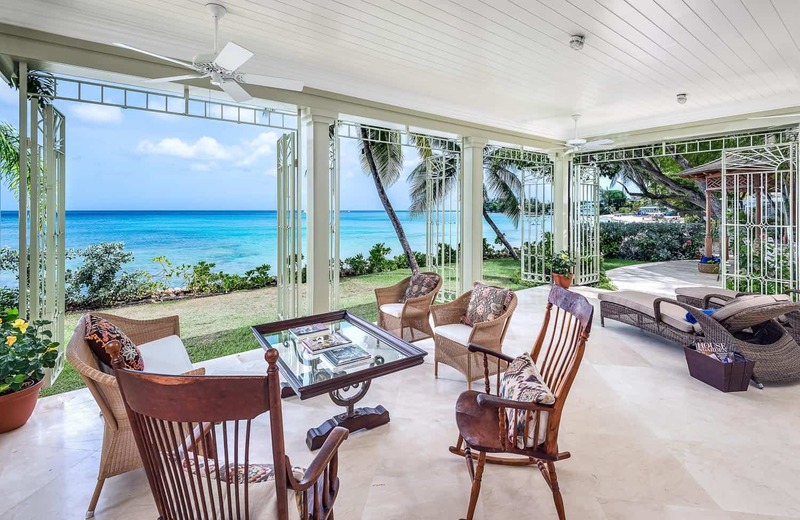 Hemingway House’s ground floor includes a fabulous “indoor/outdoor” living room/dining room which opens onto the wrap around ocean view terrace. 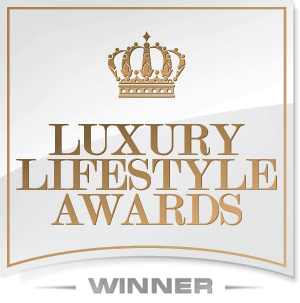 There is a garden room bedroom overlooking the pool with a fully marbled en suite, a powder room and terrace. 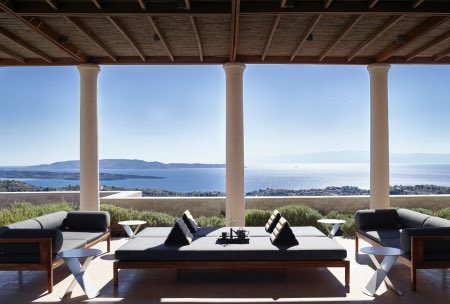 The ocean facing veranda offers an alfresco dining area, colourful Kilim furniture, bespoke light fixtures and finely crafted iron gates that fold back, opening the whole area to the sea and gardens. 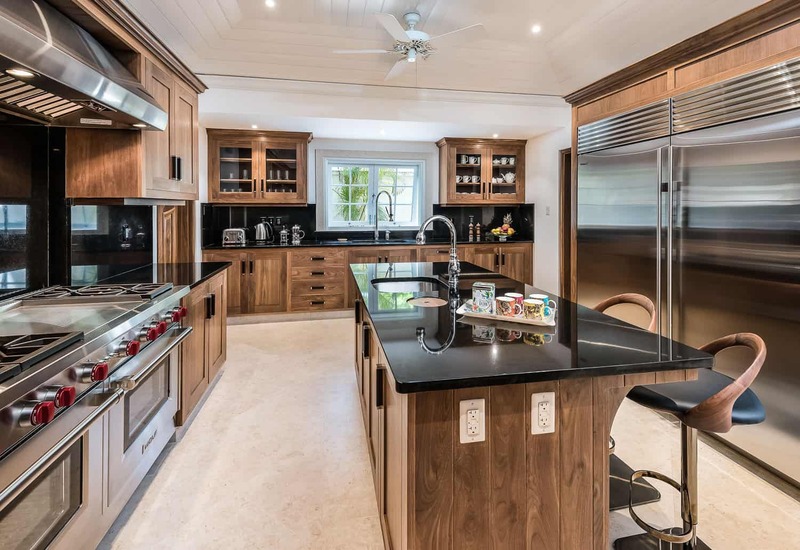 There is a fully state of the art kitchen with a professional Wolf range and oven, Miele microwave and double oven, ice maker, a Subzero double door fridge, dish washer, a walk-in pantry and David Mellor cutlery. 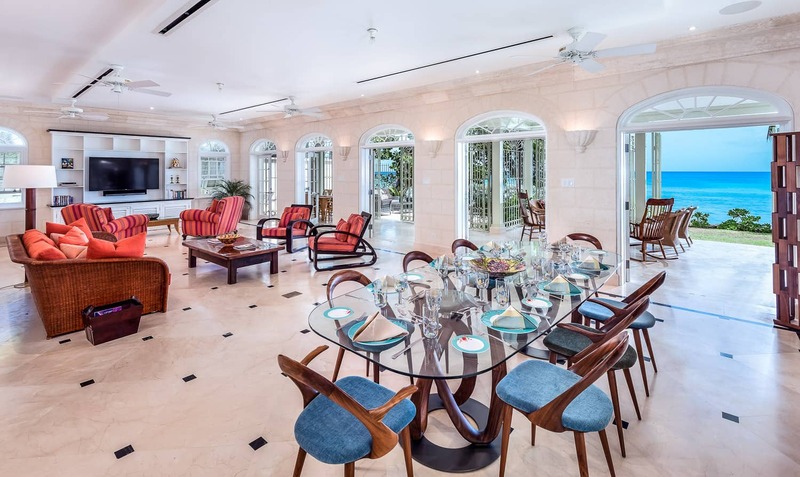 Adjoining the kitchen is a fully equipped bar connecting to the living room featuring two separate wine coolers that can keep different wines at appropriate temperatures; a second ice maker as well as a butler’s sink. There is a laundry area off the kitchen as well as staff quarters on the outside of the property. 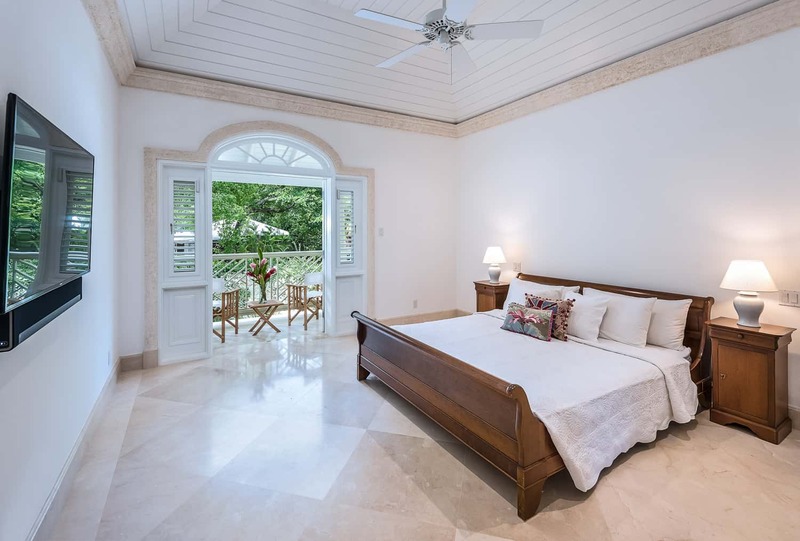 The master bedroom suite spreads along the entire upper sea-facing side of the home, and features the bedroom with en suite bathroom, a walk-in dressing room and a separate study. 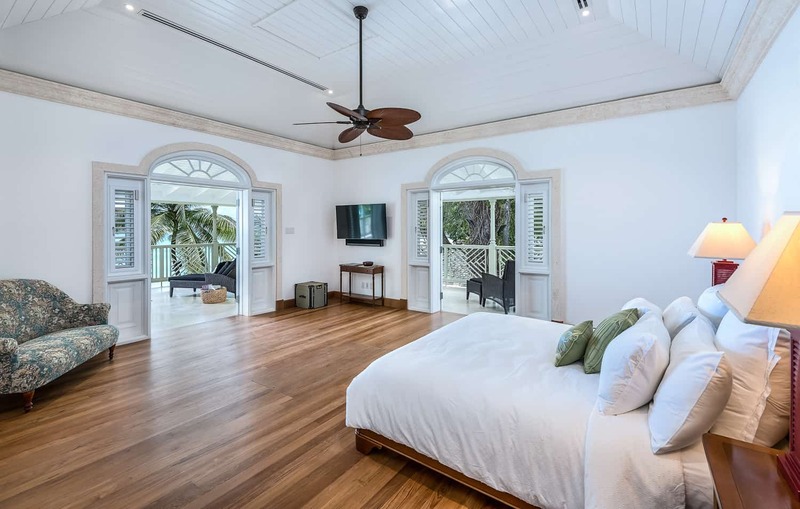 The spacious bedroom features hard wood floors and opens onto a private wrap-around balcony with ocean, bay and pool views with comfortable lounge chairs. 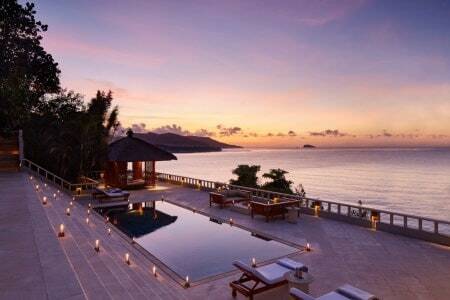 The perfect spot to unwind and watch the sunset on an evening. 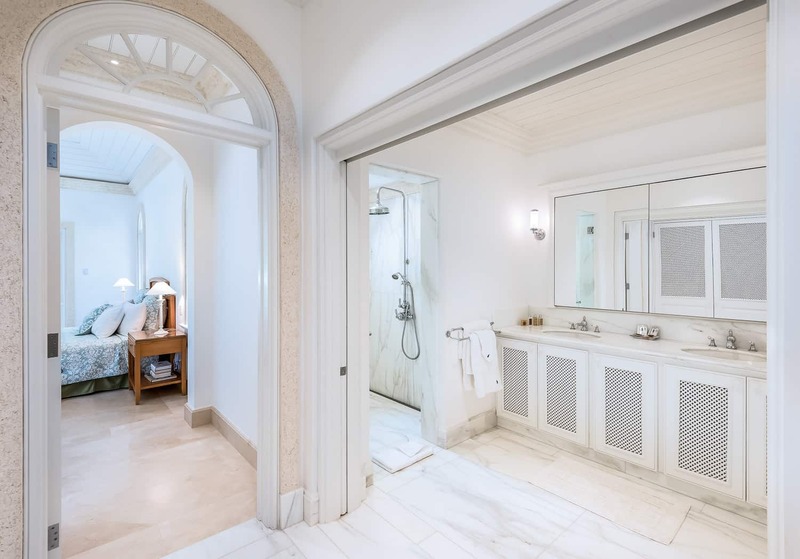 The spacious en suite bathroom features marble floors and a C.P. Hart designed Cherry wood enclosed centre piece bath, his-and-her marble vanities with elegant self standing wooden cabinet and armchair. The spacious shower features jets and separate seating. 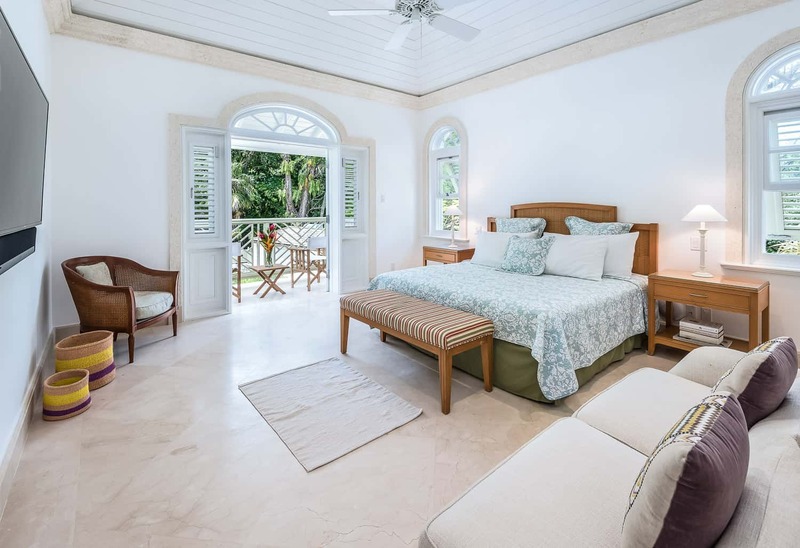 The study is positioned between the master bedroom and en suite and both the en suite and study offer also offer direct access to the bedroom suite’s wrap-around balcony. 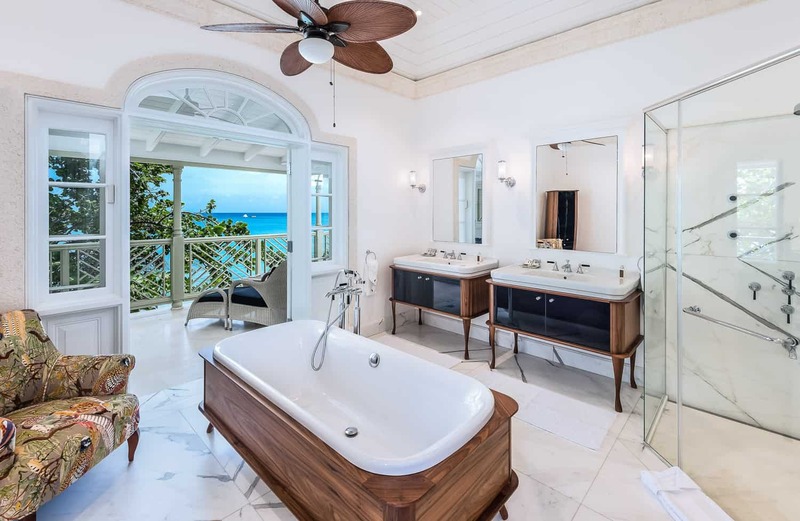 The third bedroom also opens onto the balcony with views of the pool and garden and has an en suite with his-and-hers vanity and a walk-in shower room. 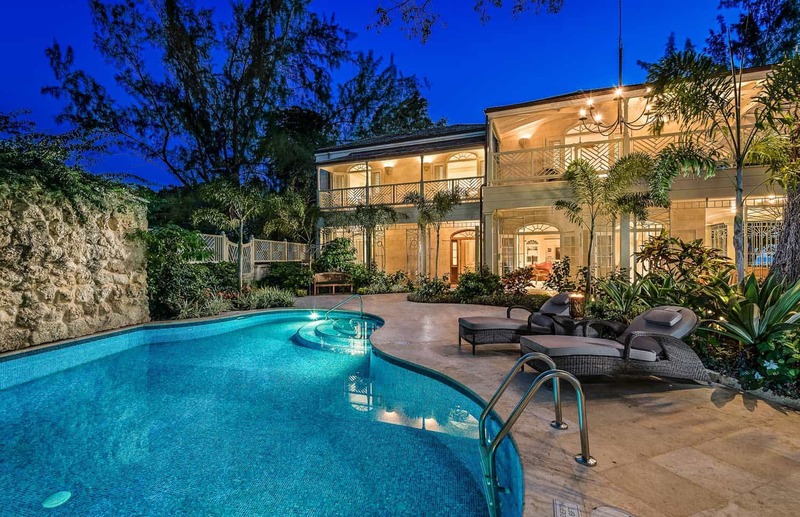 All four bedrooms feature king size beds, their own televisions and Sonos sound.